Mohini Chaudhary Junior Resident, Department of Radio-Diagnosis, Teerthanker Mahaveer Medical College And Research Center (TMMC&RC), Moradabad. Deepak Singla Junior Resident, Department of Radio-Diagnosis, Teerthanker Mahaveer Medical College And Research Center (TMMC&RC), Moradabad. Shruti Chandak Professor, Department of Radio-Diagnosis, Teerthanker Mahaveer Medical College And Research Center (TMMC&RC), Moradabad. Ashutosh Kumar Professor, Department of Pathology, Teerthanker Mahaveer Medical College And Research Center (TMMC&RC), Moradabad. Arjit Agarwal Associate Professor, Department of Radio-Diagnosis, Teerthanker Mahaveer Medical College And Research Center (TMMC&RC), Moradabad. Vijai Pratap Professor, Department of Radio-Diagnosis, Teerthanker Mahaveer Medical College And Research Center (TMMC&RC), Moradabad. Background: Myocysticercosis is a parasitic infestation caused by encysted larvae of taenia solium. The infection occurs due to ingestion of taenia eggs in raw or undercooked pork, contaminated water or vegetables which are disseminated by hematogenous route to various tissues of the human body. Myocysticercosis occurs due to muscular involvement by the parasite and is more common in population having poor access to sanitation facilities. Ultrasonography is a convenient, easily accessible and cost effective modality which can be used to demonstrate the various appearances of myocysticercosis. FNAC is diagnostic and helpful in identifying the parasite and its body parts. Aim and Objective: To evaluate the role of ultrasonogaphy in the diagnosis of myocysticercosis. 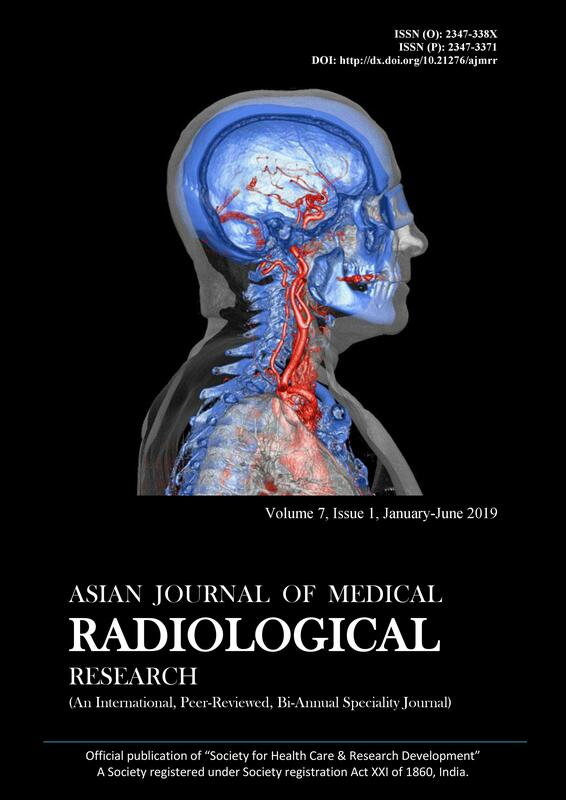 Subjects and Methods: The study was conducted in the Radiology department of Teerthanker Mahaveer Medical College and Research Centre, Moradabad. We included 50 pathologically confirmed cases of myocysticercosis who had undergone ultrasound evaluation by linear ultrasound probe 9L4 of Siemens Acuson S2000 ultrasound machine Results: Out of 50 patients that were enrolled in our study , the most common appearance was of well defined cystic lesion of variable size with an eccentric, echogenic scolex. Other appearances include ill defined cystic lesion with or without scolex or a completely calcified myocysticercosis. Most common location was found to be anterior abdominal wall followed by lower extremities, upper extremities and facial muscles subsequently. Conclusion: We concluded that ultrasound is an indispensable tool for the diagnosis of mycocysticercosis with characteristic diagnostic appearances.